Very charming - what a wardrobe you're making for her! Beautiful! I love that it is mostly handstitched. It's obvious that a lot of love has gone into that dress. Oh Anna, this is just lovely. 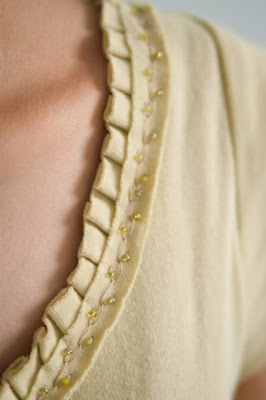 Your beaded hand stitching is indeed a work of art - a beautiful detail. Is the material your 100% cotton jersey? Please thank Clara for modeling for us - the dress is so becoming and it helps so much to see it on her. My word, that is a lovely dress! Beautifully made :) I especially love the pleated ruffle and beaded feather stitching. I love this dress, the color, all the special details. I was so happy to see the ruffles, then when I saw the beading, oh wow! I was wondering about the fabric, too. It's just the prettiest shade of green! Thanks for sharing! What a beautiful special occasion dress to take to college! A cello recital perhaps? Linden--actually, there is another, much *fancier* dress in the works for cello recitals. Grace, the nice thing about these dresses is that there is no hem. If it starts to droop I suppose you could just cut off a little more! I'm sorry I can't promise to post Clara playing the cello--that falls to the Composer and he is seriously overworked these days. Thank you for praying for us! the details are extraordinary! what a beautiful dress for a stunningly beautiful girl. Really pretty. I bet it would look great belted, too. Absolutely beautiful!! Understated elegance with casual femininity. I just love it. Thank you for sharing. This is beautiful on her! 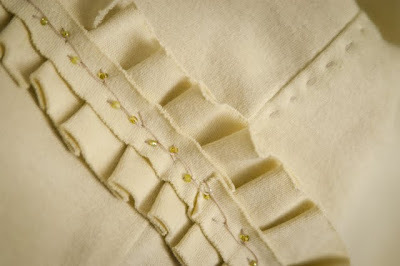 A question on the small strip hand-sewn over the ruffle: how does it wash? I know jersey doesn't fray/unravel much, but would love to see how this (or, honestly, any other projects) behave after use - which things "age gracefully" vs which have some pitfalls and where. A good question! This has held up really well through three or four washes so far, no sign of ravelling. It's a very thick (double-knit, actually). The single knit, that looks like purl stitching on the back, tends to ravel a little more, but also does great things like pull into cords, which the double-knit doesn't do. I've been washing some of our jersey garments two years now, on a frequent basis, and they are holding up really well. Beautiful dress, lovely colour. It strikes me that some of these fabulous dresses could become family heirlooms. I can just imagine Clara's grand-daughter wearing one of her granny's vintage dresses, and telling friends that it was made by great-grandma! Thanks so much for the post-washing information and the single-knit vs. double-knit explanation! That's very useful to know (especially the visual distinction so that I can tell which kind I'm dealing with). It's so good to get the knowledge so you can make the right things from each fabric - each has its talents and its drawbacks, and sewing is so much more fun when you play to the right strengths. Really lovely! Love the ruffles!